There's a lot to love about Floyd Rose's first stab at wireless headphones. They look great, are comfortable to wear and sound decent. Occasional Bluetooth issues and many a rival doing the same thing, however, mean these don't quite make the impact its makers did in the rock world. Floyd Rose is a relative newcomer in the headphone space. 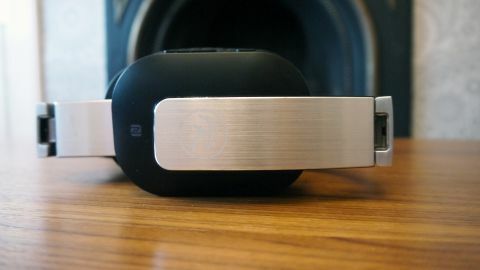 Originally launching its range of headphones in the US a few years ago, it is now trying its hand at other markets - including the UK - showcasing a range of products that cater both for those who want their cans with a little bit of style and those who want the convenience wireless offers. The Floyd Rose FR-36BK are its Bluetooth offering. They are, design wise, in stark contrast to their wired sibling, the Floyd Rose FR-18. Where that model is styled in wood and has an air of refinement, these are headphones that have a very industrial design. A chunky soft leather band sits atop ear cups that have a brush metal outer casing which has Floyd Rose’s signature on it, and the Floyd Rose circular logo is on each ear. The lozenge-shaped ear cups are made of a nice soft material that (only just) engulfs the ear when worn and, while these headphones are a little on the weighty side at 425g, they never felt to heavy on the head. The headphones are easily adjustable and fold too, fitting nice and snug in the accompanying protective case. While this design won’t be for everyone, we liked the contrast of metal and leather, it’s just a shame that this premium look and feel isn’t carried over to the headphone’s buttons. This is a blight for many a headphone manufacturer: when buttons are added to a pair of premium-looking cans, there is a danger that the plasticky nature of these will feel at odds to the rest of the design. And that’s exactly what’s happened here, the buttons (off, on and volume/phone control) just feel a little too cheap for our liking. On the underside, there is also a charging port (Micro USB) and a 3.5mm input, just in case you fancy going wired - in the box is a rope-like, tangle-free wire for this. All of these components are situated on the right-side ear cup. Let’s start with what really impressed us: the stamina of these cans. The manufacturer quotes 14 hours’ talk/music listening time and we easily got that with these headphones, so much that it came as a surprise when we actually had to charge them again - which took a couple of hours for a full charge. While this amount of juice will be enough for many, it has to be said there are cheaper options on sale now that can go for 40 hours so, while it's impressive, Floyd Rose is still playing catch up. Connectivity is through Bluetooth 4.0 and they are also APTX enabled. You can also connect through NFC, if you are that way inclined. Volume is sometimes an issue when connected to Bluetooth but this wasn’t the case with the Floyd Rose FR-36BKs, they were loud enough with more to go and this wasn’t at the detriment of the crispness of the sound. Given these headphones are made by the same company that revolutionized the whammy bar in the 80s, it was only apt that we put on some hair metal in our tests. Here We Go Again by Whitesnake was rawkus and robust and we are pleased to note that the headphones barely budged when we did a little bit of head banging. Bon Jovi’s Wanted Dead or Alive transported us to a dusky Old West town, the guitar twang at the beginning was picked up well by the FR-36BKs. Away from rock and Childish Gambino’s This Is America lost none of its melodic ferocity when listened to through the headphones, and they held up well to the complexity of Kamasi Washington’s epic Street Fighter Mas. We would have liked a bit more bass and a bigger sound (it’s not helped that there’s no active noise cancelling here, so some lower frequencies are lost to background noise) but we’re putting that down to the fact a 40mm driver was opted for and not a 50mm one. There was also an issue occasionally with connectivity. These headphones were tested in and around London and when you enter any busy train station in the UK's capital, Bluetooth cans struggle. The amount of wireless shenanigans going on seem to jam, or at least stutter, Bluetooth and this certainly happened with these. But, where many a headphone we've tested recovered quickly when away from a train station, on a number of times, we had to turn the FR-36BKs off and on again to get a decent, non-stuttering signal. When the battery on the headphones was getting low, a similar thing happened. It didn't make these headphones any less enjoyable to use but the stuttering happened enough times for us to notice it. A full charge and away from train station noise, however, and we encountered no problems whatsoever. The Floyd Rose FR-36BKs are a very capable set of headphones, but ones that feel a little long in the (Blue)tooth. They look great, though, and for those who like the industrial style are perfect ear warmers. But, the Bluetooth headphone market is moving quickly. Battery life is increasing at a rapid rate and connectivity is improving all the time. The FR-36BKs feel a little like an old rocker, in this respect. They've definitely still got it, and they ooze charm, but there are plenty of other plucky upstarts with more stamina around if you want to look elsewhere.